All pets are to be currently vaccinated. Should Pet Sitter be bitten or otherwise exposed to any disease or ailment received from Client’s animal, it will be the Client’s responsibility to pay all costs and damages incurred by the victim. Should medical attention be necessary, Pet Sitter is authorized to seek emergency veterinary care. Client releases Pet Sitter from all liabilities related to transportation, treatment and expense. Every attempt will be made to notify Client regarding such situation. However, if Client is not reachable and time is of the essence Client authorizes Pet Sitter to approve medical and/or emergency treatment (excluding euthanasia) as recommended by a veterinarian. Client agrees to reimburse Pet Sitter/Company for any expense incurred, plus any additional fees for attending to this need or any expenses incurred for any other home/food/supplies needed. In the event of inclement weather or natural disaster, Pet Sitter is entrusted to use best judgment in caring for pet(s) and home. We will make every attempt to visit as scheduled with the possible exception of a Level 3 snow emergency, as required by law. Pet Sitter/Company will be held harmless for consequences related to such decisions. Although we try our best to be flexible, we reserve the right to charge for visits cancelled without at least 24 hours notice, especially in peak times such as holidays. The utmost of care will be given in watching both your pet(s) and your home. However, due to the extreme unpredictability of animals, we cannot accept responsibility for any mishaps of an extraordinary or unusual nature (i.e., bitings, furniture damage, accidental death, etc.) or any complications in administering medications to the animal. Nor can we be liable for injury, disappearance, death or fines of pet(s) with access to the outdoors. The first time a client uses our service, payment is due in full PRIOR to service. Existing clients have the option of paying in advance or being invoiced. Client acknowledges that payment is due immediately upon completion of a scheduled service period without further invoice or notice. A finance charge of 10% per month will be added to unpaid balances after 30 days. A handling fee of $10 will be charged on all returned checks. A 50% deposit is required on lengthy assignments. Preferred method of payment is Bill Pay, where you can set us up as a Bill Pay client and your bank mails us a check. Clients with a history of late payment will be required to pay in advance before future services are rendered. In the event it is necessary to initiate collection proceedings on the account, Client will be responsible for all attorney’s fees and costs of collection. We accept cash, as well as checks made payable to Critter Sitters In Home Pet Care. 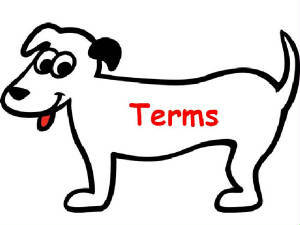 Pet Sitter and Client each may terminate this contract at any time by written notice to the other. Pet Sitter will be entitled to payment for all services rendered until notice of termination is received, and for any transition services reasonably required to provide for the health and welfare of Client’s pets. Pet Sitter will not terminate during a period of scheduled service unless Pet Sitter determines, in its sole discretion, that a danger exists to the health or safety of Pet Sitter. If such concerns preclude Pet Sitter from providing further care of the pet, then Client authorizes pet to be placed in a kennel, with all charges to be charged to Client. Every attempt will be made to notify Client regarding such situation. *All clients must sign a contract acknowledging & agreeing to these terms, prior to service.